Our Solar Container Solution is based on 40 feet container and can be shipped by truck on road and by sea also. This opens totally new opportunity to transport your solar farm to any place on world. Mobile construction allows to build temporary solar farm on places where is no power connection, like military, research bases, disasters areas etc. 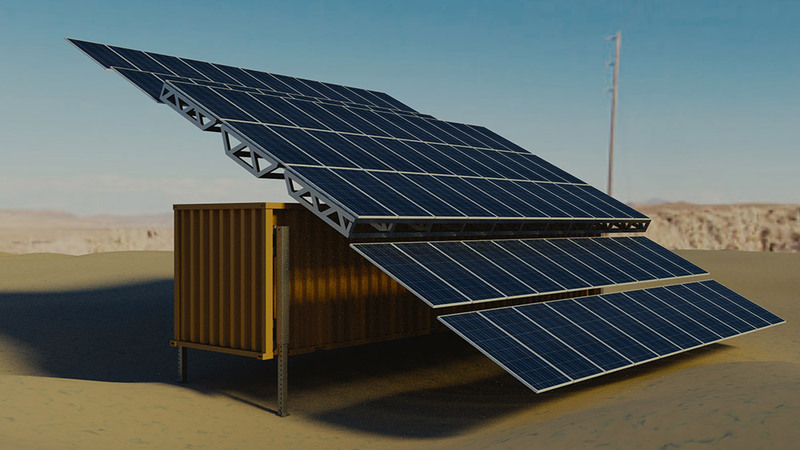 Mobile Solar Containers is designed to be as flexible and user friendly as possible. Just one operator is necessary to prepare farm for power harvesting. It takes about 20 minutes to prepare farm to work since coming to location. Whole photovoltaic panels are mounted on special hydraulic controlled subframe. Lifting up the mast is opening the solar area and makes it couple times bigger that container area. There is no power needed for lifting operation because system is using power from batteries charged by panels on last use. Farm area can be even over 110 sqrm what gives You free green energy power, enough to fund small village or base. Our solution is friendly for nature. Solar power energy is free and do not emit any pollution like petrol generators. Join our mailing list for informations about solar container!